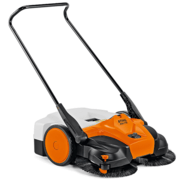 This battery powered efficient sweeper is the top of the range Stihl sweeper in the manual pushing range. 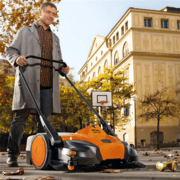 By using the the high quality Stihl AP 160 lithium-ion battery you can clean areas up to 2000 squared meters on surfaces that are wet or dry! Equipped with two sweeping brooms with a gap large enough to pick up an object the size of a soft drink can meaning you can keep the area you desire clean easily and efficiently. 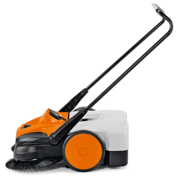 The sweeper hangs outside the parameters of the product meaning you can clean right up against the edges of your property so you don't miss any little bits. The sweeper can also be used manually when you are recharging the batteries. 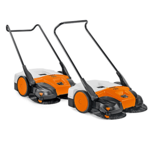 These innovative Stihl sweepers can handle dust, dirt, cans and plastic bottles as heavy duty and wet debris is no issue. Very fine dust is no match for this Stihl sweeper as you can easily keep your areas clean. 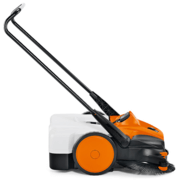 The handle makes this Stihl sweeper easy to operate and you can change it to suit the driver. The handle also folds down or can be removed making transportation a breeze. 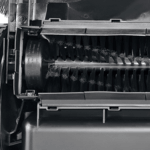 The direct transmission feature improves the efficiency of the product in comparison to the belt driven sweepers making it light and easy to control. 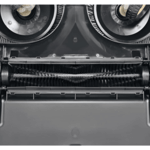 When reversing the machine the sweepers also begin to turn inward preventing dust from being expelled. 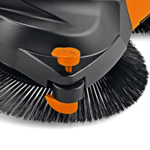 This additional feature allows any fine dust that is not collected by the main sweepers to be picked up and collected by the secondary sweeper. 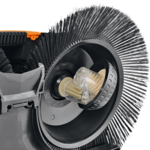 The Stihl sweeper is also equipped with spacer rollers on the side guide to protect the sweeper and wall from any unwanted damage.